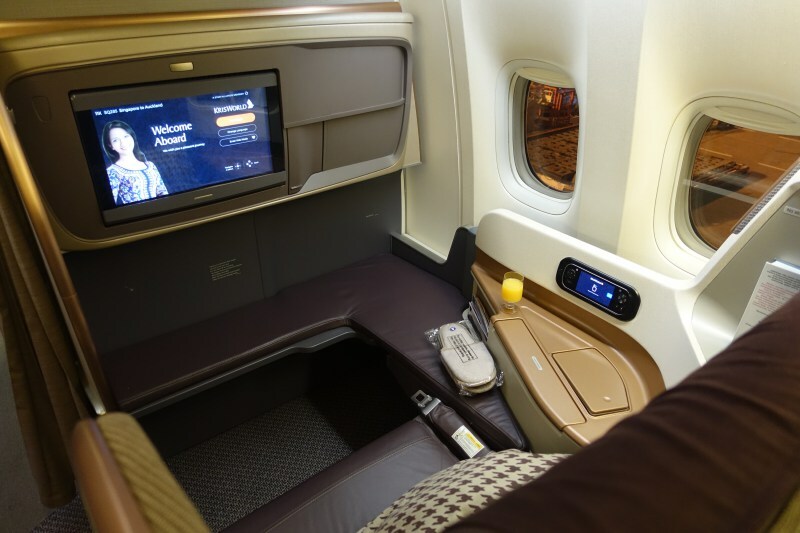 This Singapore Airlines 777-300ER Review is from our Singapore to Auckland overnight flight. Also see our Singapore First Class 777 Review, Singapore Suites A380 Review, and all our posts tagged Singapore Airlines. Singapore Airlines 777-300ER Business Class has 48 seats in a 1-2-1 configuration in two business class cabin. There's a first class cabin of 4 seats, then the first business class cabin of 3 rows, rows 11-13, a galley, a second business class cabin of 9 rows, a Premium Economy cabin, and 2 Economy cabins. 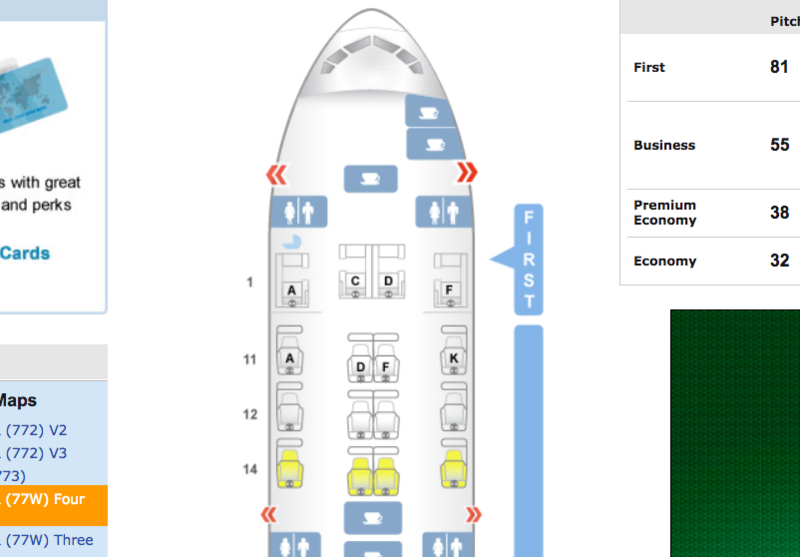 I'd recommend selecting a seat in one of the first two rows of the first Business Class cabin, in rows 11 or 12. If traveling solo or wanting a window, choose 11A, 12, 11K or 12K, and if you don't care about a window seat and are traveling as a couple, select couple's seats 11D/11F or 12K/12F. Here's a YouTube video of the Singapore 777-300ER Business Class cabin, seat, and highlights from our dining and in-flight experience. Singapore's Business Class Cabin is a bit roomier on the 777 than the A350, by about 1 foot, although the business class seats on both are 28 inches across. As I mentioned in my Singapore Business Class A350-900 review, the seats are roomy in terms of width, but I'd gladly have given up some of that width for more comfortable seats for sleeping, as I'll explain below. The seat is easy to adjust for lounging, with the seat controls. But you can't recline the seat all the way to a bed; instead, you have to put it back into an upright position and fold the backrest down to make the bed. There's a slider, which for seat 11K was on my right, to provide access to a power outlet. Singapore Airlines does not provide an amenity kit for business class passengers, but as the airline is celebrating its 70th anniversary, there was a grey bag that included The Laundress fabric freshener and crease remover, as well as hand sanitizer. A little random in terms of the provided products, but perhaps useful to some. The Business Class menu was already at each seat, and had a festive party design to celebrate the 70th anniversary. Here was the dinner menu for our flight, although we only had the appetizer from this menu, since we'd already pre-ordered via Book the Cook. We were offered a pre-flight drink, and as I was getting hungry, not having had much in the lounge, I asked for some orange juice. It was just from concentrate, not fresh squeezed. Since this was Business Class, there wasn't any kind of amuse bouche, and I missed the satay appetizer that is served in Singapore First Class and Singapore Suites. The antipasto appetizer wasn't bad, but it wasn't anything special either. That said, the great thing about flying from Singapore on Singapore Airlines in Business Class, First Class or Suites are the more extensive Book the Cook menu preorder options. 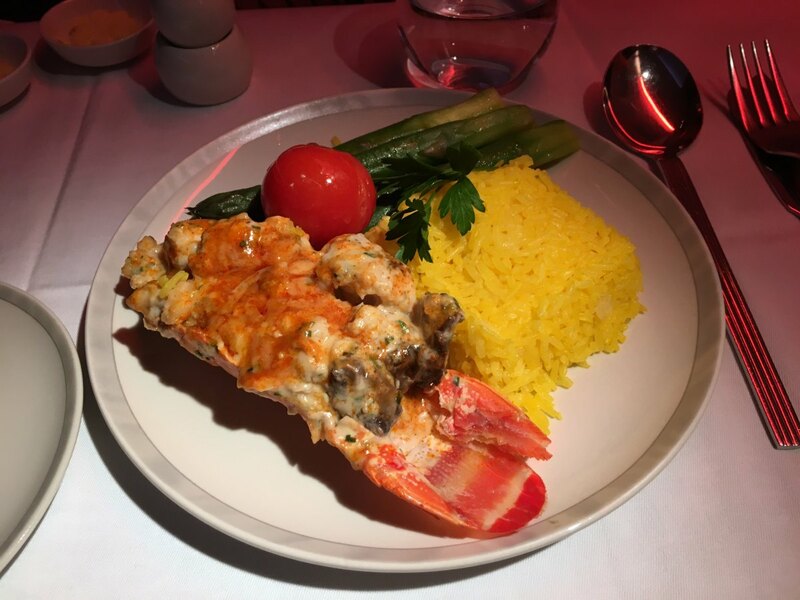 My son had pre-ordered the Lobster Thermidor, which as far as I can tell, is exactly the same in First Class and Business Class. It's tasty, but I enjoyed my Singaporean dish even better. Singaporean Laksa isn't fine dining, but it's hearty and very tasty. The Singapore Book the Cook version was very rich, so it may not agree with all stomachs for traveling, but I enjoyed it, especially with the addition of the accompanying sambal chili paste to up the heat. The next morning, before our arrival into Auckland, I enjoyed some juice and fresh fruit. This time the juice tasted closer to fresh squeezed; different juice was used for pre-flight drinks vs. breakfast. My Book the Cook selection was Nasi Lemak, a Malaysian dish of coconut rice with fried chicken, sambal prawns, fried anchovies with peanuts, an omelet wedge and grilled fish cake. Again, this is a homestyle, comfort food type dish, but it was just as good as the version I'd recently enjoyed at the Fullerton Bay hotel breakfast buffet. My son slept almost until arrival, but managed to eat a yogurt for his breakfast. It was more like a dessert, and I would have preferred a less sugary, organic option. While generally the bulkhead seats are supposed to have the most room, even in 11K I would have found the Singapore Business Class flat bed impossibly uncomfortable to sleep in if I hadn't had my Therm-a-Rest mattress pad with me. Thanks to it and a sleep aid (and no fussing baby, as on our Moscow to Singapore flight) I did get a few hours of sleep. I still consider these seats poorly designed, however, since the footwell is not large and you have to sleep at a weird angle. The bed will not be comfortable for you if you're tall and like to sleep stretched out on your back. And if you sleep on your side, you may fit better, but find the sleep surface too firm. I thought the service on this Singapore 777-300ER Business Class was better and less harried, and enjoyed dining on this flight much more, thanks to our Book the Cook selections, especially the Laksa and Nasi Lemak. I still dislike the Singapore Business Class seat, however, for several reasons. I dislike having to get up out of the seat to make it into a bed, rather than reclining it into the bed. Nor do I see the point of this design choice, since the bed's surface is uncomfortably hard and you have to sleep at a weird angle, with little room for your feet. Because of this, I prefer JAL Business Class, Cathay Business Class, and Austrian Business Class beds, especially when using a Therm-a-rest mattress pad for the latter two. If you've flown Singapore Business Class recently on the 777-300ER, what was your experience? 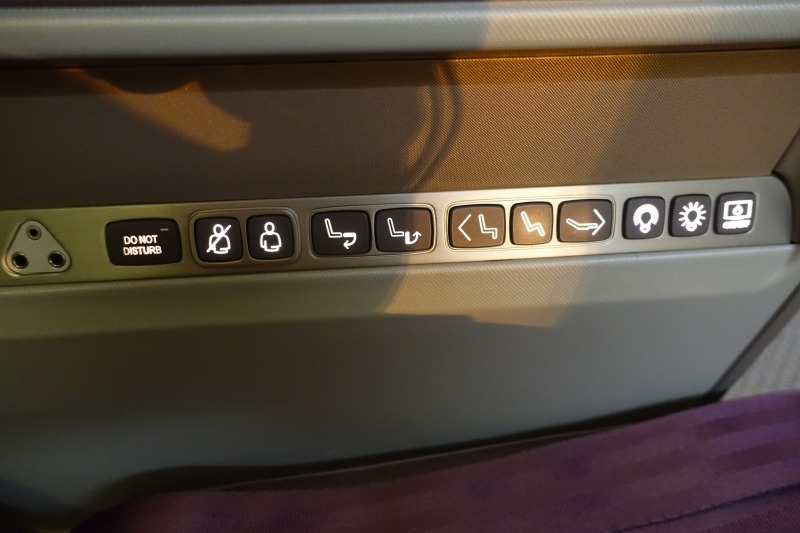 1 Comment on "Review: Singapore Airlines Business Class 777-300ER"
I agree. Business class seats are the worst I’ve experienced. Very hard & uncomfortable. Will avoid using again.